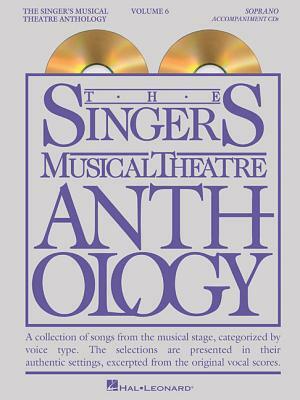 The Singer's Musical Theatre Anthology - Volume 6 [With MP3] (Hardcover) | The Drama Book Shop, Inc.
(Vocal Collection). This edition includes two CDs with accompaniment tracks for all the pieces in the corresponding songbook. Contents: THE ADDAMS FAMILY: Waiting * BIG FISH: I Don't Need a Roof * THE BRIDGES OF MADISON COUNTY: Almost Real * What Do You Call a Man Like That * Always Better * CARRIE: When There's No One * CHAPLIN: What Only Love Can See * CINDERELLA: He Was Tall * There's Music in You * CLOSER THAN EVER: Patterns * DEATH TAKES A HOLIDAY: How Will I Know? * Who Is This Man? * FAR FROM HEAVEN: Tuesdays, Thursdays * Heaven Knows * A FUNNY THING HAPPENED ON THE WAY TO THE FORUM: That Dirty Old Man * A GENTLEMAN'S GUIDE TO LOVE AND MURDER: I Don't Know What I'd Do Without You * Inside Out * GHOST THE MUSICAL: With You * Nothing Stops Another Day * GIANT: Your Texas * I BELIEVE IN YOU: They Ask Me Why I Believe in You * INTO THE WOODS: On the Steps of the Palace (film version) * JOHN & JEN: That Was My Way * THE LITTLE MERMAID: The World Above * Part of Your World * Beyond My Wildest Dreams * A LITTLE NIGHT MUSIC: Soon * LOVE NEVER DIES: Love Never Dies * A MAN OF NO IMPORTANCE: Princess * MATILDA THE MUSICAL: This Little Girl * PASSION: Happiness * ROCKY: Raining * SATURDAY NIGHT: What More Do I Need? * THE SCARLET PIMPERNEL: Only Love * THE SECRET GARDEN: Come to My Garden * SHREK THE MUSICAL: A Morning Person * WEST SIDE STORY: I Have a Love * YOUNG FRANKENSTEIN: Listen to Your Heart.